*Typical amounts. Ranges: 40- ... 56 mg alpha-tocopherol, 44- ... 60 mg alpha-tocotrienol, 80- ... 96 mg gamma-tocotrienol, 22- ... 28 mg delta-tocotrienol. Tocomin SupraBio® is a registered trademark of Carotech Inc. and protected by US Patent Nos. 5,157,132, 7,544,822 and 6,596,306. Non-medicinal ingredients: mono- and diglycerides, diacetyl tartaric acid esters of mono- and diglycerides, sucrose fatty acid esters, propylene glycol dicaprylate/dicaprate. Softgel: gelatin, caramel, glycerin. AOR™ guarantees that all ingredients have been declared on the label. Contains no wheat, gluten, corn, nuts, peanuts, sesame seeds, mustard, soy, dairy, eggs, fish or shellfish. Pro Toco-E is a tocotrienol-rich, concentrated and bioavailable red palm oil extract enhanced with CoQ10 and nanoVAILABLE technologies. 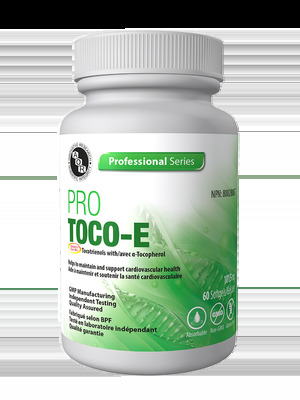 Pro Toco-E is a soy-free vitamin E completely derived from natural nutrient-dense red palm oil. It contains a small amount of alpha-tocopherol and a high dose of all four tocotrienols (alpha, beta, gamma and delta-tocotrienol)..
Research supports a role for high-dose tocotrienols in supporting healthy cholesterol and blood lipid balance and in protecting the liver, thanks to their antioxidant and blood-thinning effects. Tocotrienols also support healthy blood vessels, have antioxidant activity, and directly regulate key inflammatory pathways in the body. Based on the published science, no individual tocotrienol is most potent, as each isomer of tocotrienol works best in different part of the body and synergistically as a team. Pro Toco-E is the only tocotrienol source that has shown increased bioavailability, bioaccessibility and bioactivity. Only Pro Toco E full spectrum palm tocotrienol complex provides all four forms of tocotrienols. Caution: Caution in patients taking blood pressure medication, or for use beyond 8 weeks. Do not use if individuals are allergic to palm oil.